As mentioned above, this is the +2 oxidation state of the Iron element and is considered as a stable ion. Its oxide is green in color, and it is the first step in the formation of rust. As Iron is a metal, it needs to release or give away electrons and form positive ions, in order to gain a stable electron configuration. The general electron configuration for the iron element can be written as 1s22s22p63s2 3p6 4s23d6. When it comes to ferrous, two electrons are released from the 4s orbitals as it is the outermost orbital. However, 3d orbitals are higher in energy than the 4s orbitals. Therefore, discharge of electrons takes place from the 4s orbitals, even though electrons are filled into the 3d orbitals at last. Therefore, the electron configuration of the ferrous iron would be 1s22s22p63s2 3p6 3d6. Now this ionic form is able to form compounds and complexes with other elements and negatively charged ions. These complexes can also be in ionic form and, in that case, they are generally known as ‘transition metal compounds.’ When naming this kind of inorganic complexes, the term ‘Ferrous’ is often replaced with the names of the element and its valency is given within brackets, such as ‘Iron (ll) oxide’. Some examples for famous ferrous compounds are FeO, FeCl2, FeSO4, etc. Ferric is known as the +3 oxidation state of Iron and is the most stable form of Iron in the air. Upon the oxidation of Iron, it turns into ferrous oxide and in the presence of more oxygen the ferrous ion get oxidized to form ferric ions, in this case ‘ferric oxide’ which is rust. It is a brown color flaky material. Getting back to the definition, in order for the ferric ion to form, the elemental form of Iron needs to give away three electrons from its orbitals. The resulting electron configuration of the ferric ion would be: 1s22s22p63s2 3p6 3d5. This configuration has more stability than the ferrous ion and also the elemental form. As this configuration satisfies the partial electron filling. To explain it more, there are five d’ orbitals. Any configuration where the orbitals are fully-filled or half-filled is considered to be higher in stability than the other forms. In the case of ferric ion, each d orbital contains an electron, making it half-filled as d orbitals contain five electrons. 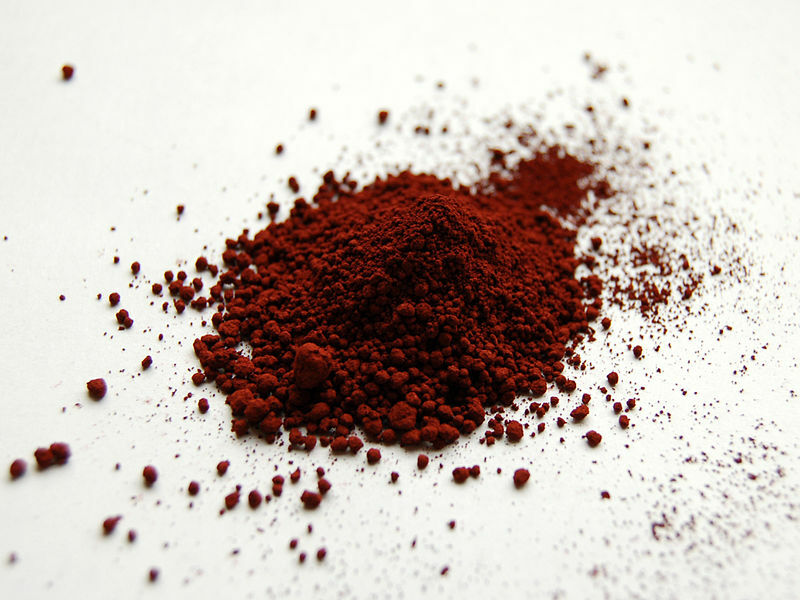 Ferric ions too form other compounds and complexes, and when naming inorganic complexes, it is written as ‘Iron (lll).’ Some of the most common ferric compounds are Fe2O3, FeCl3, Fe2(SO4)3, etc. Ferrous is the +2 oxidation state of Iron. 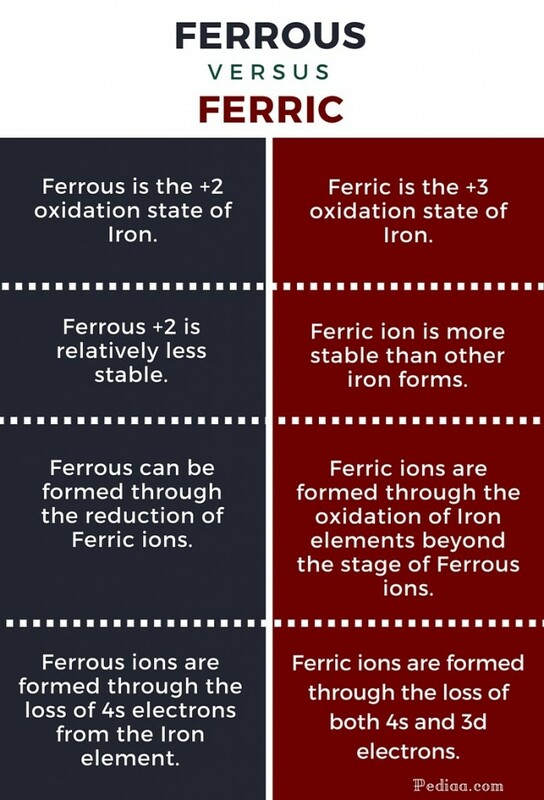 Ferric is the +3 oxidation state of Iron. Ferrous +2 is relatively less stable. The ferric ion has its d orbitals half-filled in the outer-most shell, making it more stable than other forms of Iron. 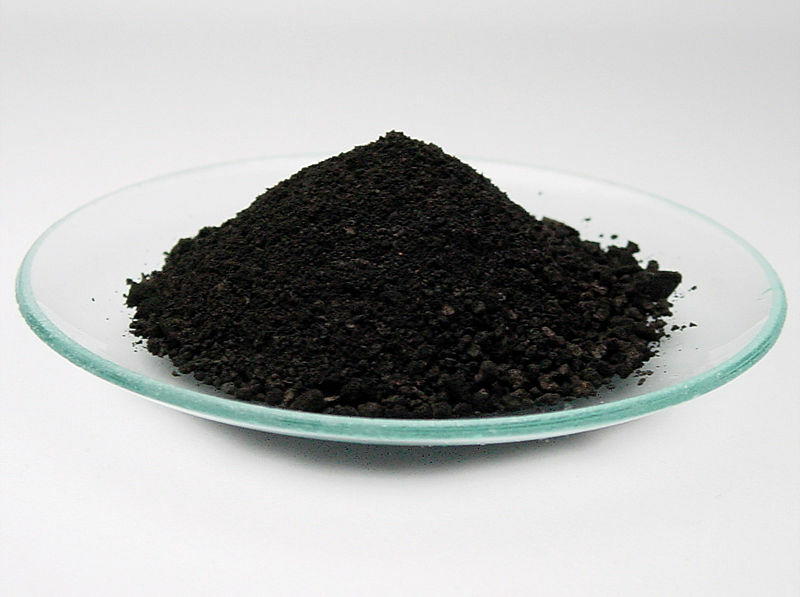 Ferrous can be formed through the reduction of Ferric ions. Ferric ions are formed through the oxidation of Iron elements beyond the stage of Ferrous ions. Ferrous ions are formed through the loss of 4s electrons from the Iron element. Ferric ions are formed through the loss of both 4s and 3d electrons.